Toronto, Canada – June 23, 2014 – 9 Story Entertainment is pleased to announce that its series Peg + Cat (80 x 12’) has won three Emmys at the 2014 Daytime Emmy Awards, including Outstanding Pre-School Children’s Animation Program, Outstanding Performer in an Animated Program (Hayley Faith Negrin) and Production Design (Jennifer Oxley). The series originally debuted on PBS Kids in the U.S. in the fall of 2013 and on Treehouse in Canada in March of this year. Peg + Cat has also been licensed by Super RTL (Germany and German-speaking Europe), Canal+ Family (France and French-speaking territories), ABC TV Australia, TVNZ (New Zealand), SVT (Sweden), YLE (Finaland), HOP (Israel), Mini-Mini (Poland), E-Junior (UAE), Zee Learn (India) and Disney (Korea). Created by Emmy Award winning creative director, animator and children’s writer Jennifer Oxley (Little Bill, The Wonder Pets!) and Billy Aronson (Rent, Postcards from Buster), Peg + Cat is co-produced by 9 Story Entertainment and The Fred Rogers Company for PBS Kids. 9 Story has international distribution rights to the series. The series follows an adorable spirited little girl, Peg, and her sidekick, Cat, as they encounter unexpected problems that require fun and creative solutions. 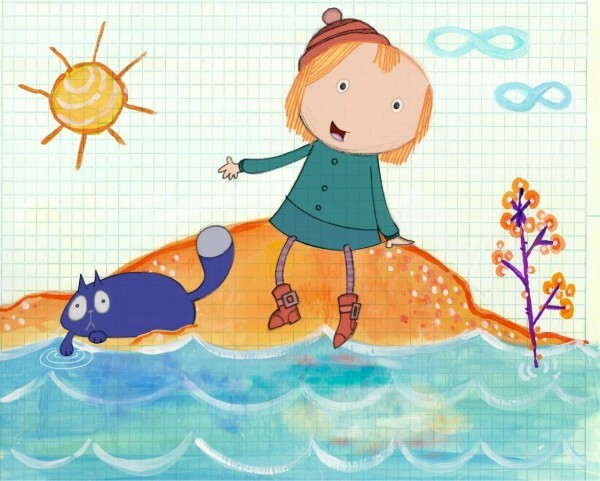 In order to solve the problems, Peg and her cat must add, subtract and apply basic arithmetic. Their adventures take them to historical far-away lands, art centers in bustling metropolises and the colourful cosmos, all the while demonstrating that it’s never too early to start learning the magic of numbers. This entry was posted on Monday, June 23rd, 2014 at 3:05 pm	and is filed under News. You can follow any responses to this entry through the RSS 2.0 feed.